What makes employee candidates want to work in a company? How does a company attract candidates?What makes employees willing to go to work day after day? The answers to these questions lie within the company culture. Its importance is a hot topic of discussion these days. But what is it that really makes it important? What makes company culture something to rave about? Google has been famous for its company culture for years, long before Facebook and Twitter got in the game. It offers its employees free meals, bonuses, trips, gyms, parties, generous maternity leaves, massages and most importantly for some; a dog-friendly environment. But apart from all these perks, Google is known for its support for creativity and flexibility. By creating a friendly work-space where the employees feel trusted, Google manages to have one of the most successful cultures in terms of innovation and shared values and purposes. The rapid growth Facebook has been through hasn’t kept it from creating innovations in company culture. Providing social connections for billions of people worldwide, Facebook manages to provide its employees with clear and consistent communication within the workplace. With its company values encouraging risk-taking, rapidity, and openness; Facebook also holds up a pleasant amount of competition in the workplace. This enables the employees to create better and better ideas within friendly limits. The greatest social network also has an open office policy, with everyone from the CEO to the assistants working in one giant room. This serves as a great boost to the vibes of cooperation and community. This flat organizational culture also promotes the sense of equality and valued-ness among the sweet, sweet competition. Okay, Twitter has rooftop meetings, yoga classes, a lot of vacations and a team-oriented environment. Twitter is also known for its emphasis on continuous learning, with a “Twitter University” for hundreds of classes available for the employees. But there is one other thing that makes the company’s culture uniquely special: Employee’s enjoyment of working with one another. They take on pride in working with people that does something that matters in the world and works for true accomplishments, with a company that aims at change and enhancement. One employee even says “Team meetings on the roof are the best, great teamwork and a lot of smart people. I love how the 10 core values drive the company to always be better.” (Twitter Software Engineer) Who wouldn’t enjoy working with other smart people who love to learn? They base their values on costumer satisfaction, and provide one of the most successful customer services in the world. In addition to this, they have established firm company values that brought them to where they are. In hiring processes, they insist on finding these in each of their employees to keep their high standard. Hsieh believes that these criteria are more important than the job-related skills their employees have. And by providing their employees with a sense of control, progress, meaning and connectedness; Zappos gets its employees to connect to the company and to one another as a whole, working as a united organism. What is more, they actually pay their new employees to quit after the first week if they are not satisfied with what they are doing! Netflix works with clear expectations from its employees. Instead of watching over the employees with vacation policies and annual reviews, it makes its expectations and values clear and enables the employees to monitor themselves. So the employees aren’t evaluated by working hours but by their accomplishments. Thus by making the employees take on responsibility of policing themselves, Netflix has manages to set a unique and autonomous company culture. Costco believes that the employees come first. Despite being America’s second largest retailer, Costco has managed to keep its big success going without major troubles. The CEO Craig Jelinek says “We know it’s a lot more profitable in the long term to minimize employee turnover and maximize employee productivity, commitment and loyalty.” Aiming for the hearts of the employees, Costco manages to keep their employees happy by speaking to their needs first. Evernote holds a view of flat corporate hierarchy, trying to get rid of huge gaps between different positions within the company. To achieve this, Evernote puts communication in the workplace first and uses a video wall that connects the studio office with the headquarters. “We want you to be able to explain what you mean; we want you to be articulate.” says Libin, highlighting their priority of communication in their work environment. Growing from a start-up to a successful and growing company, Evernote continues to charm its employees with the work-life balance, open communication and friendly work environment it offers. Adobe follows a “Work hard, play hard” motto, believing gun in the workplace contributes to the work being done. At the same time, it gives great importance to sincerity and honesty; allowing its employees to keep up open and trustworthy relationships. In line with this and similar to Netflix’s strategy, Adobe doesn’t use ratings to build up employee skills. Higher officers work as coaches rather than bosses, and they allow for freedom and creativity both in the work and in the assessment of the work. Walt Disney works with four principles: Innovation, support, education and entertainment. Aiming at memorable experiences full of creativity and storytelling, Walt Disney creates a fun and improvement-based work place. It offers programs to get the employees to view themselves as a part of a entertainment community that strives to reach excellence. This value that the company holds leads to high motivation as well as high quality products. Full of optimism in the workplace, Walt Disney’s environment offers a kind and supportive team to work with that will make every moment of it worth remembering. “Fantastic heritage, pride and culture, wonderful community, amazing growth opportunities, creative atmosphere.” says one Walt Disney Company Employee. We all know Nike advises its customers to “Just do it”, but the same goes for its employees as well. “Workers quote the company’s maxims like the Ten Commandments. More than a dozen tell me, independently and unprompted, ‘Be a sponge’ and ‘If you have a body, you’re an athlete,” Austin writes. Following their motto strictly, Nike creates a strong attachment to its company culture. The waffle machine co-founder BBill Bowerman smashed when trying to make rubber soles is kept around in the offices still. So the company takes great pride in their innovations and uses them to keep their company values and culture alive and kicking. Creating a work culture that will make the employees happy and the innovation and creativity flowing is a difficult thing. But it is no distant dream either. With a little thinking out of the box, company culture can create wonders both for the company’s success and for the employees. As can be seen in the work cultures of these giant companies, employee satisfaction can be the way to success for the company. The first step in creating this booster of performance is to acknowledge its importance. Then follows the ways of achieving it that fits the values and the traditions of a company. It might take a while, and reaching the superior standards set by these companies might not always be possible. But even the attempt will be worth the hard-work. 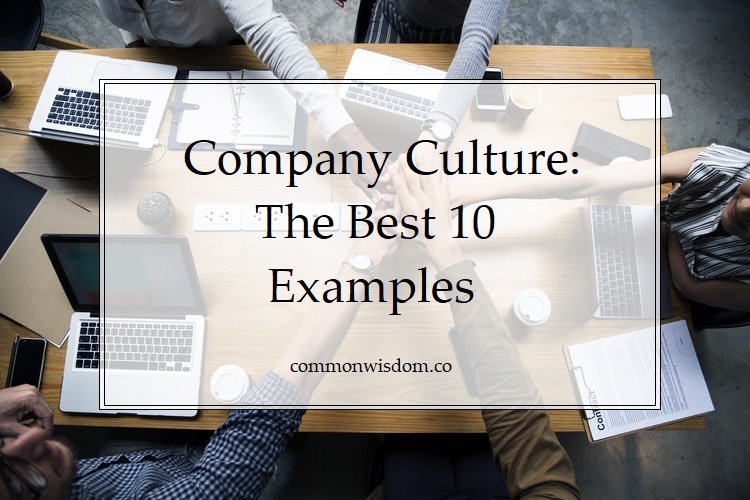 And once the benefits of a great company culture start flowing in, it will become apparent on the faces of the employees when they are coming to work every morning how much of a change a strong company culture can make.